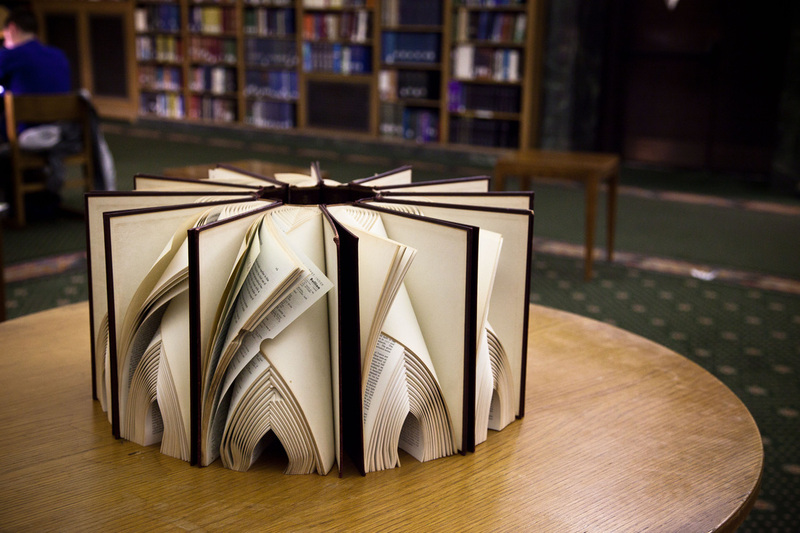 Math Monahan’s installation Specimen is book art that cannot be ignored. 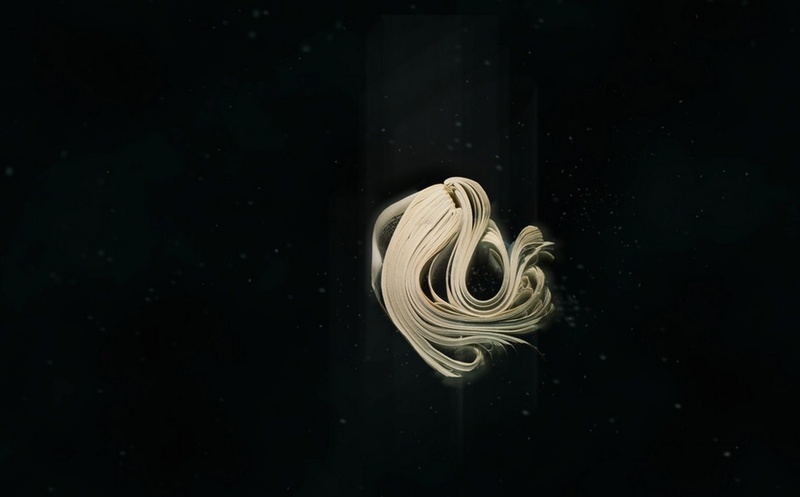 The images above constitute a mesmerizing series on Monahan’s site. It is as if we are looking at photographs of deep-sea creatures or impressions of fossils or slides of microscopic organisms. The latter impression is reinforced by the petri dishes in which the circular images are framed, but of late, the organisms, shown in the rectangular photos, have escaped the petri dish to occupy an undefined abyss. Like snorkeling or diving for the first time in strange waters, the experience of viewing Specimen is beautiful, exhilarating and a bit scary. The words quoted above and fixed alongside the images are humorous, wistful but still, in the end, a bit scary. The book: evolution or extinction? The plots had a characteristic shape. For example, “1951” was rarely discussed until the years immediately preceding 1951. Its frequency soared in 1951, remained high for 3 years, and then underwent a rapid decay, dropping by half over the next 15 years. Finally, the plots enter a regime marked by slower forgetting: Collective memory has both a short-term and a long-term component. But there have been changes. The amplitude of the plots is rising every year: Precise dates are increasingly common. There is also a greater focus on the present. For instance, “1880” declined to half its peak value in 1912, a lag of 32 years. In contrast, “1973” declined to half its peak by 1983, a lag of only 10 years. We are forgetting our past faster with each passing year. Ironic that. Analysis of the “DNA” extracted from over 5 million specimens of the organism designed to preserve our past tells us that we are forgetting it more quickly year by year. Curious about his interactions with the book species, I wrote to Math Monahan to ask if we could conduct the “in medias res” experiment: to go to his bookshelf, select a volume from the middle of any shelf, open the volume to its center pages, tell me what is there and answer a set of questions. What are the objects immediately on either side of the selected book? As you take the book from its place, what are your physical sensations? How does the book feel to you? As you open to its middle page, what do you hear, smell or see about it or around it? Do you recall the circumstances of acquiring the book? What were you doing when you acquired it? Why this book? As an artist whose work has an intimate relationship to “the book,” could you describe the effect this has on you when you are reading books in general? Turning the question on its head, when the act of creating a work rather than the act of reading is in flight, how do books feed your working process? MM: I decided to choose from my “to read” shelf. The book I found in the center felt “right” as soon as I saw it there. Although it was on my “to read” shelf, I decided to read it before replying. I wasn’t sure if I wanted to or not, I think it was the right choice. Anyway, here is my choice. As you can see, the book I’m using has a slightly different layout. Author of Everything is Illuminated, Foer took one of his favorite books, The Street of Crocodiles by Polish-Jewish writer Bruno Schulz, and used it as a canvas, cutting into and out of the pages, to arrive at Tree of Codes. BoB: And what about the books and things around it, and what you felt as took Tree of Codes from the shelf? MM: To the left stands the book, Folklore and Book Culture by Kevin Hayes. To the right, two wooden boxes stacked, act as a book end/space filler, followed by more books. The larger box on the bottom contains various samples of handmade papers. The smaller box on top contains blank note cards. As I removed the book I felt the unfamiliar squeezing of pages that I was surprised by when I first bought the book. It was caused by the cutouts on each page. They create the different densities that differ from the standard solid-block feel of a book. When I opened the book to its estimated middle page, I remember being very gentle. The layout of the book made the pages delicate lattices that I am very careful to keep intact. The carefulness must have overridden my other senses, because I don’t remember anything else. I thought the book felt “right” when I found it because, as a book artist, I work with the form of the book and the book as an object. That is my main interest. 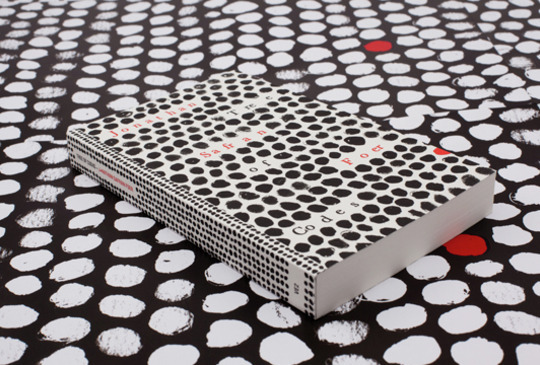 This book is published by Visual Editions, a publishing company that believes “books should be as visually interesting as the stories they tell” (www.visual-editions.com). This idea meshes well with ideas in my own work. BoB: Now that you’ve read Tree of Codes, you will have noticed how The Street of Crocodiles has pretty much disappeared. Almost but not completely. Are there echoes of that phenomena in your own work? MM: Yes. Often the content of the books I’m using in my work is irrelevant. I am exploring the book as a physical form. Through folding, braiding, warping or any other alteration, I am revealing the transformative nature of the book. Each one holds different possibilities. My struggle is in convincing the viewer of this. We have a tendency to immediately read text, almost instinctual. Can text be texture? Is there more information contained in a book than words and images? While a part of my process is (what I have been calling) relieving the book of text, I don’t feel this is an act of violence against any author(s). It is clear in Tree of Codes that the removal of text is an act of love or admiration for the primary story. My admiration is for the object itself. The text will live on in many forms. I am not using rare or one-of-a-kind books here. BoB: Do you recall the circumstances of buying Tree of Codes? What were you doing when you decided to buy it? What prompted the purchase? MM: I found it in a Barnes and Noble. I remember being surprised to see it there because it is a sort of unconventional book. I quickly put together that the author, Jonathan Safran Foer, recently had one of his books made into a movie and that could prompt the store to have all his works in stock. Still, I was very pleased to find it. I was introduced to the book about a year earlier by a friend. It was coming home with me that day, no question. BoB: As an artist whose work has an intimate relationship to “the book,” could you describe the effect this has on you when you are reading books in general? The question may have different answers depending on the type of book or your intention on opening the book, so feel free to qualify your answer as you like. MM: I think my relationship to “the book” changed how I approach books in any context. For better or for worse, I have noticed this change. The phrase, “Don’t judge a book by its cover.” comes to mind here. I find myself judging a book not only by its cover but also by its weight, size and shape, the textures of its cover and pages. Even by the fonts used in the body of the text are included in this analysis. Of course I read the summary and printed comments on the back, but these often fall after the book passes the physical tests. BoB: Turning the question on its head, when the act of creating a work rather than the act of reading is in flight, how do books feed your working process? MM: This is where all the information gathered through the process described above come into use. Understanding how paper textures interact with colors and fonts, how negative space in a text block affects how quickly you move through the book, how the lines of text change as you curl and warp the pages; all are now the backdrop to the creation of my own work. Sometimes this raw data is in the forefront of my thoughts while I’m working, while other times it is synthesized into a cloud of intuitive responses. The latter is often what I’m referring to when I say something “feels right”. BoB: Decades ago, Peter Frank commented that exhibiting artists books behind glass was to confine them ” in some anaerobic chamber”. Unless your “organisms” in Specimen present themselves in the equivalent of a petting zoo, their exhibition requires us to stand at a distance and prompts us to view the book as an object to be regarded rather than “read” in the usual sense. Your installation Between is another case in point but intriguingly different. There, you have taken two sets of books, opened each book, braided its pages so that it stands open and arranged each set of braided books in a circle spine to spine. 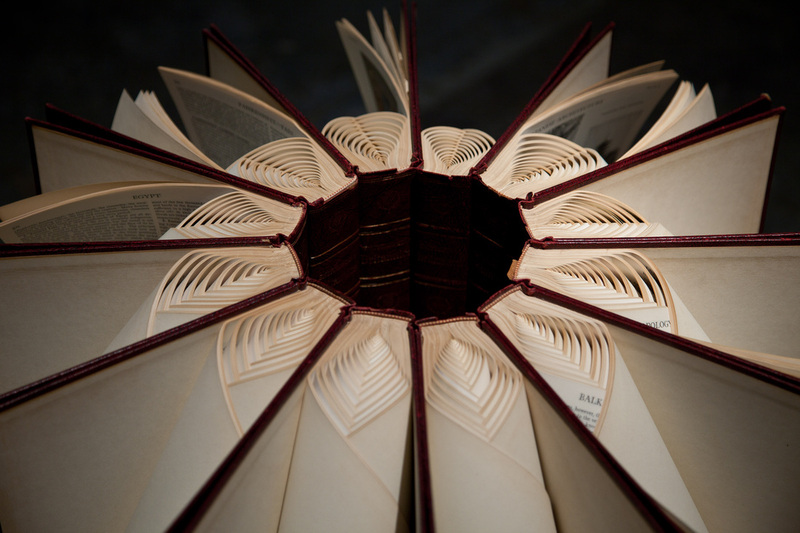 The circle arrangement holds the set together, without adhesives or mechanical apparatus, and the pages slowly unbraid themselves, each book returning to its original form. Although the installations, one in the Penny Stamps Graduate Studio and the other in the Hatcher Graduate library of the University of Michigan, are not under glass or otherwise fenced away from the “reader”, the “reading” or art experience can only occur as the unfolding occurs. And, of course, being in two separate locations, the installations do not allow us to experience them simultaneously. Yet, you intend “the installations [to] form a whole existing between the two spaces”. So while Specimen is “at a distance” from us in one way, Between is so in another. With Specimen, we are relatively passive viewers. With Between, although we are not reading the unbraiding volumes, we are more active, almost participating. Our “witness” to the unbraiding is a necessary element of the artwork, but is that unbraiding toward forgetfulness and extinction or memory and renewal? MM: Participation is the point of books. They are meant to be interacted with. That interaction has become a recent focus, especially thinking of library books and other books as they pass through several hands. I can admit, reading a good book leaves its mark on me. But what marks do we leave of books? What are the traces of these intimate interactions? Through time, whole communities are embedded in these artifacts. Find a book from a library or thrift store and try to imagine everyone that has ever handled that specific edition. Can you feel them around you? I aim to reveal that community. BoB: One last question. Between forgetfulness and extinction, on the one hand, and memory and renewal, on the other, where would you bookmark us and the book? MM: Whether book sales are up or down, it’s irrelevant. Even if the extinction of books never happens, the fact that text CAN be read digitally opens the book to possibilities beyond text, similar to (in my opinion) what happened to painting with the invention of photography. Artists are still working in representation, even hyperrealism, but the rapid expanse of painting and thought behind what a painting is – that is the direction that I’d like to see our interaction with books move in. Czeck, Jessica. “Between: Beautifully Braided Books”, Visual News, 10 March 2013, accessed 30 January 2014: http://www.visualnews.com/2013/03/10/between-beautifully-braided-books/. Eukel, Jennie. “Artist Math Monahan Turns Books Into Works of Intricate Beauty”, Modern Midwest, 16 April 2013, accessed 30 January 2014: http://modernmidwest.com/things/artist-math-monahan-turns-books-into-works-of-intricate-beauty. Klima, Stefan. Artists Books: A Critical Survey of the Literature. New York: Granary Books, 1998, p.67, citing Jacqueline Brody, “Peter Frank: A Case for Marginal Collectors”, Print Collector’s Newsletter, IX, no. 2, March-April 1978, p. 44. Michel, Jean-Baptiste et al. “Quantitative Analysis of Culture Using Millions of Digitized Books”, Science, 14 January 2011, Vol. 331, no. 6014, pp. 176-182, accessed 19 September 2013: DOI: 10.1126/science.1199644. Abt, Jeffrey. The Book Made Art: A Selection of Contemporary artists’ Books Exhibited in Joseph Regenstein Library – University of Chicago, February Through April 1986, Exhibition catalog. Antaya, Christine and Sloman, Paul. Book Art: Iconic Sculptures and Installations Made from Books. Gestalten (May 26, 2011). Documents current art, installation, and design created with and from books. “The fascinating range of examples in Book Art is eloquent proof that–despite or because of digital media’s inroads as sources of text information–the book’s legacy as an object and a carrier of ideas and communication is being expanded today in the creative realm.” Book jacket. See interview with Antaya and some of the artists here. The Book as Instrument: Stephane Mallarmé, the Artist’s Book, and the Transformation of Print Culture – Anna Sigridur Arnar. An academic study of the literary and cultural seedbed of book art. “This is a highly ambitious, original account of Stéphane Mallarmé’s lifelong engagement with the book and the vast network of forces (cultural, aesthetic, political) that both informed this engagement and were transformed by it. Anna Sigrídur Arnar seamlessly brings together divergent areas of inquiry in order to support the idea that the book was and remains a site of numerous debates about democracy, public and private space, the uses of art and print, and the role of authors and readers. The Book as Instrument is elegantly written, in engaging and highly readable prose. Arnar succeeds in presenting and analyzing with remarkable lucidity ideas that many of us have learned to approach as difficult and thus nearly off-limits. This will be an important work of scholarship for a variety of disciplines.” (Willa Z. Silverman, Pennsylvania State University). Art Is Books: Kunstenaarsboeken/Livres D’Artistes/Artist’s Books/Künstlerbücher – Guy Bleus. Catalog of a travelling exhibition in 1991. See also Artists’ Books on Tour edited by Kristina Pokorny-Nagel. No Longer Innocent: Book Art In America 1960-1980 – Betty Bright. A history of an important period in book art. Like Drucker (below), Bright categorizes book art, places it within the movements of the period and profiles its individual and institutional supporters. Artbook review. Artists’ Books: The Book As a Work of Art, 1963-1995– Stephen Bury. Explores the impact artists had on the format of the book. A Century of Artists Books — Riva Castleman. New York: Museum of Modern Art, 1994. NAL pressmark: AB.94.0020. A catalog of an exhibition held at the Museum of Modern Art in New York. The selection tends toward the livre d’artiste but does address the impact of the digital shift on artists’ books. 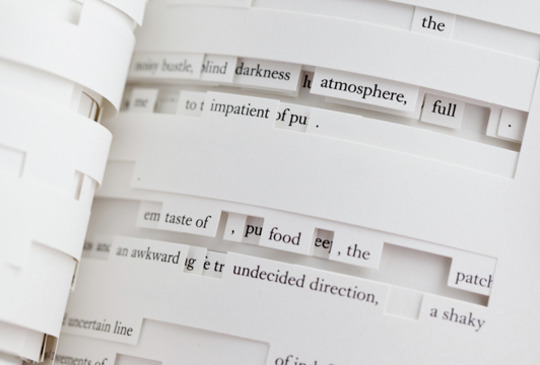 New Directions in Altered Books – Gabe Cyr. A book of projects and techniques by a book artist. The Century of Artists Books – Johanna Drucker. 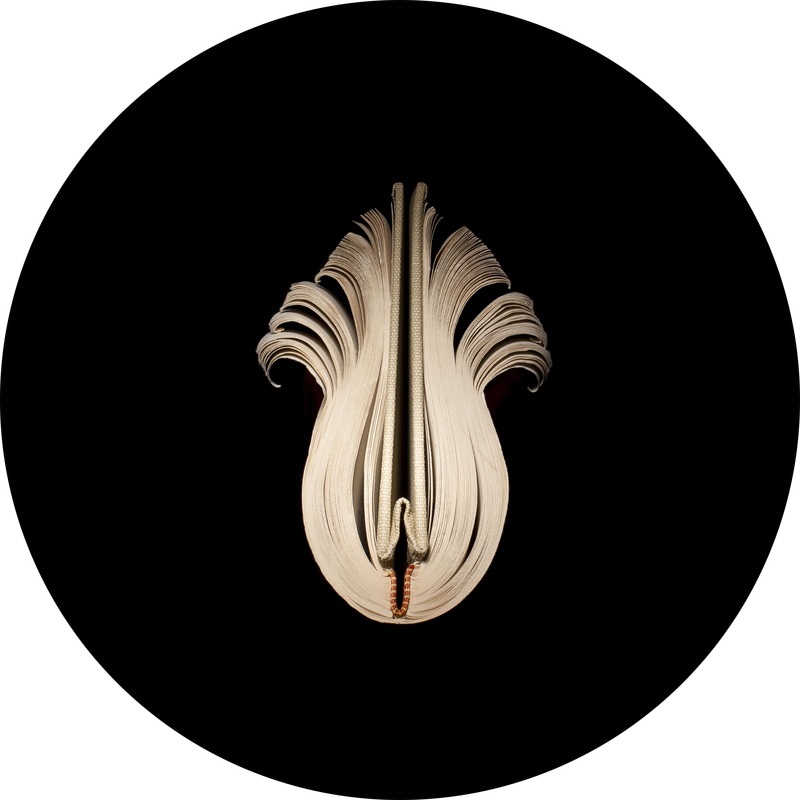 “A folded fan, a set of blocks, words embedded in lucite: artists’ books are a singular form of imaginative expression. With the insight of the artist and the discernment of the art historian, Drucker details over 200 of these works, relating them to the variety of art movements of the last century and tracing their development in form and concept. This work, one of the first full-length studies available of artists’ books, provides both a critical analysis of the structures themselves and a basis for further reflection on the philosophical and conceptual roles they play. From codex to document, from performance to self-image, the world of artists’ books is made available to student and teacher, collector and connoisseur. A useful work for all art collections, both public and academic.”Paula Frosch, Metropolitan Museum of Art Library, Library Journal. #5168 Altered Book – Special Effects (Design Originals) – Laurie Goodson. One of a series of booklets on book-alteration techniques. Other authors include Beth Cote and Cindy Pestka. Altered Books, Collaborative Journals, and Other Adventures in Bookmaking – Holly Harrison. 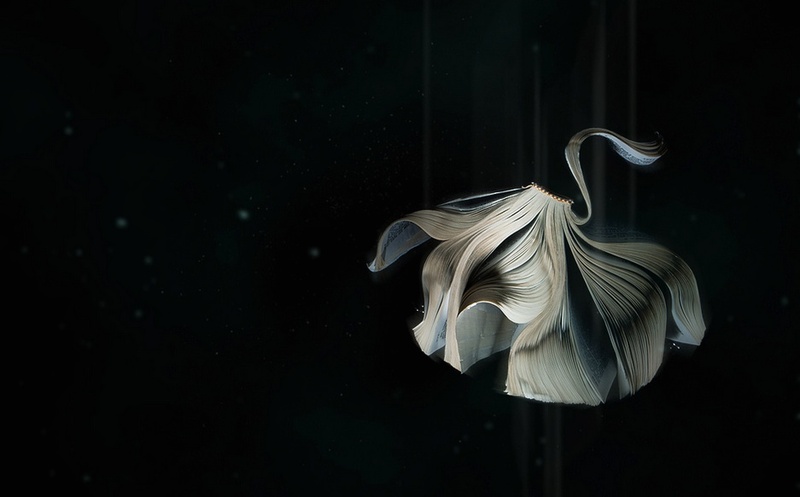 A showcase of book art with an emphasis on multi-artist collaborations. The Cutting Edge Of Reading: Artists’ Books – Judd Hubert and Renee Hubert. Published in 1999, a close examination of 40 examples of book art. Illustrated. 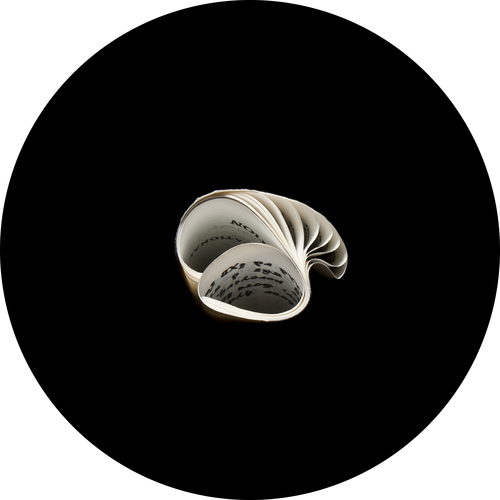 Books Unbound – Michael Jacobs. A book of projects by a book artist. Artists’ Books: A Critical Survey Of The Literature – Stefan Klima. A 1998 monograph summarizing the debates over the artists’ book. Book + Art: Handcrafting Artists’ Books – Dorothy Simpson Krause. A book of projects by a book artist; covers mixed-media techniques as well as bookbinding. The Penland Book of Handmade Books – Jane LaFerla (Editor); Alice Gunter (Editor); Lark Books Staff. Tutorials, inspiration and reflective essays by book artists. 500 Handmade Books – Steve Miller. A highly illustrated, wide-ranging coffee table book. Artists’ Books on Tour – Kathrin Pokorny-Nagel. Catalog of a travelling exhibition organized and sponsored by MAK (Austrian Museum of Applied Arts, Vienna), MGLC (Llubljana’s International Centre of Graphic Arts) and UPM (Museum of Decorative Arts) in 2011. 1,000 Artists’ Books: Exploring the Book as Art – Sandra Salamony. External and internal views of works, descriptions at the end of the book. 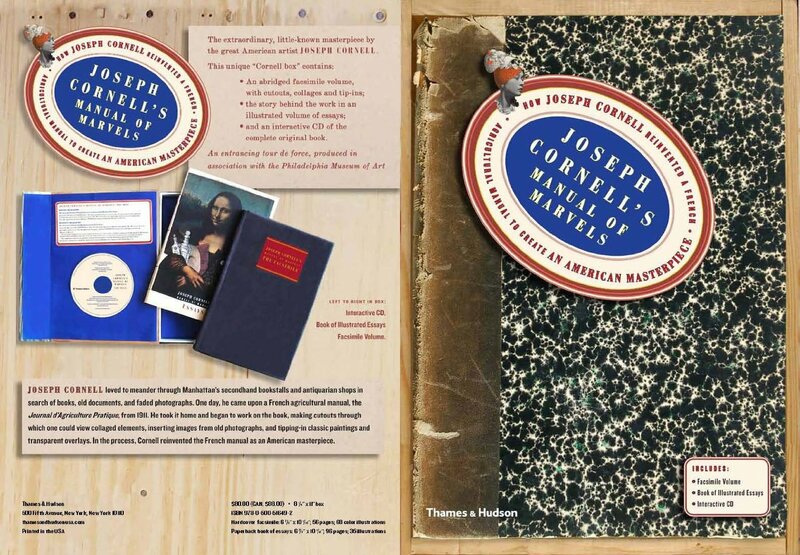 Joseph Cornell’s Manual of Marvels: How Joseph Cornell reinvented a French agricultural manual to create an American masterpiece – Dickran Tashjian and Analisa Leppanen-Guerra (editors). A part-facsimile, part-DVD, part-boxed-presentation that gives some idea of the artwork by Joseph Cornell held in the Philadelphia Museum of Art. The artwork is Cornell’s alteration of the Journal d’Agriculture Practique (Volume 21, 1911), a handbook of advice for farmers. Playing with Books: The Art of Upcycling, Deconstructing, and Reimagining the Book – Jason Thompson. Techniques-driven; covers bookbinding, woodworking, paper crafting, origami, and textile and decorative arts techniques. 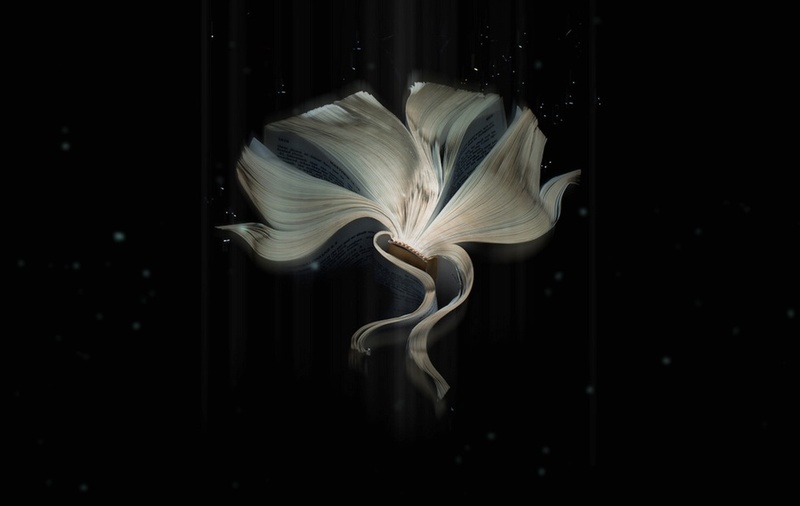 Masters: Book Arts: Major Works by Leading Artists – Eileen Wallace. Illustrated selection of work from 43 master book artists with brief comments from the artists about their work, careers, and philosophies. 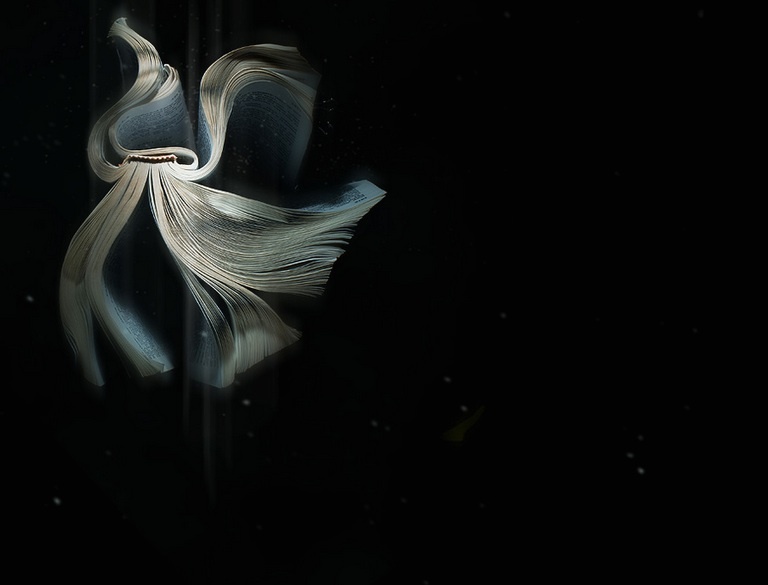 The Book As Art – Krystyna Wasserman; Audrey Niffenegger (Text by); Johanna Drucker (Text by). An illustrated volume covering over 100 artists books held in the permanent collection of the Museum of Women in the Arts, Washington, D.C.
Book Art: Creative Ideas to Transform Your Books, Decorations, Stationary, Display Scenes and More – Claire Youngs. A crafts book of 35 projects.